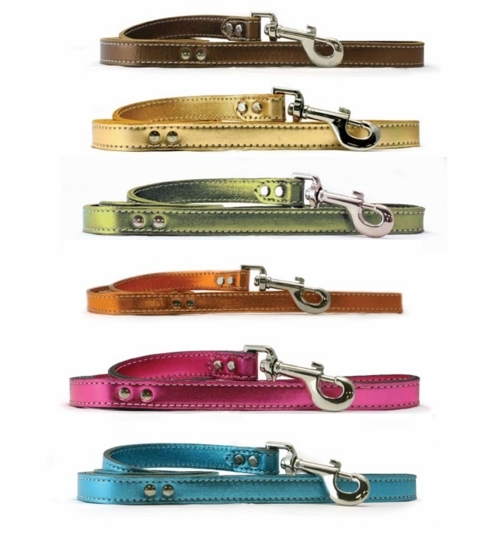 This dog collar is available in 3 widths and 9 sizes and in colors Baby Blue, Blue, Black, Emerald Green, Jade, Mandarin, Orange, Pink, Purple, Red, Yellow, Metallic Apricot, Metallic Blue, Metallic Bronze, Metallic Emerald Green, Metallic Gold, Metallic Lime Green, Metallic Pink, Metallic Purple, Metallic Red and Metallic Turquoise. The #6079 is 1/2 inch wide and available in sizes 10, 12 and 14 for $11.00. The #6080 is 3/4 inch wide and available in sizes 16, 18 and 20 for $12.00. The #6081 is 1 inch wide and available in size 22, 24 and 26 for $15.00. 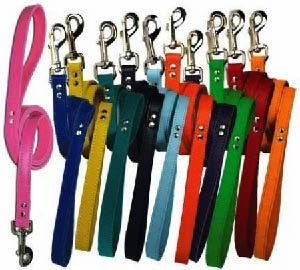 Size 10 will fit a dog with a 6 to 7-1/2 inch neck. 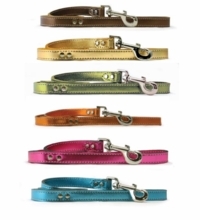 Size 12 will fit a dog with a 8 to 9-1/2 inch neck. 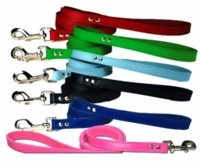 Size 14 will fit a dog with a 10 to 11-1/2 inch neck. Size 16 will fit a dog with a 10 to 13 inch neck.